Collide-O-Clown. Please do not use it without my permission. 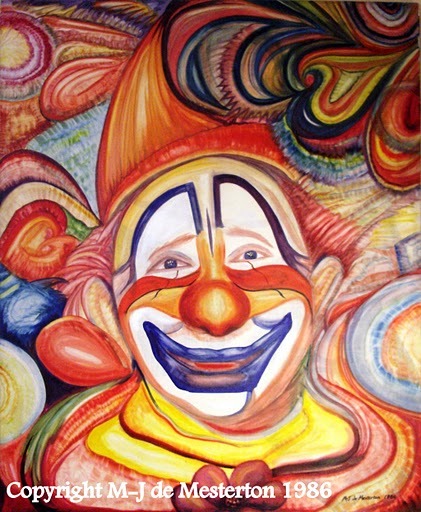 I remember that on August 4th, 1986, while painting this clown, I was listening to the old New York radio station, WNEW a.m., and heard the bad news that their premier disc-jockey and raconteur, William B. Williams had passed away. This definitely had an impact on the clown painting. William B. was only 62, but back then, I was 30, and that seemed ancient. For years, I had listened to Willie B.’s morning show, Make-Believe Ballroom Time, during which he played big band classics and standard ballads by the greats. He always started his show with a cheery, “Hello, World!”. I listened to William B. Williams in my art studio at 45 West 45th Street every morning while working on pictures for the advertising and news industries. Jonathan Schwartz was on the air at WNEW a.m. during that time, as well. His program was called, “New York at Night,” and he played the “Chairman of the Board”–William B. Williams’ nickname for Frank Sinatra, and “The Best there Is”, Jonathan’s moniker for Tony Bennett. Alas, the station no longer exists as it did, though I’m sure that some entity is using its call-letters, WNEW a.m. I think the frequency was 1130. I bought the WNEW book commemorating its 50-year anniversary, entitled “Where the Melody Lingers On”, in 1984. Inside it, I have news-clippings on the station and its great personalities, including William B. Williams’ obituaries from the New York Times and the New York Post. William B. Williams was a Dean of the Friars, knew nearly everyone, and the Friars Club named its billiards room after him.